For various cereal and flour milling plants granulators are used for processing bran and other waste products. In the household for cooking, fodder for animals, which can long be stored, it is possible to make a simple pellet mill with his own hands. From metal area weld a frame for the future of the granulator. Of sheet metal, also by means of welding manufacture of the box - the base of the granulator. The box should have a large hole in the top horizontal edge with a diameter equal to the diameter of the matrix (usually the matrix standard diameter for each model). This hole will be loaded starting material: feed, grass meal, etc. Around the hole, reinforce the sides up to a height of 7-10 cm In the lower, horizontal edges of the box make a hole for the rotation shaft of the matrix. In the side face of the box cut a square hole for the final product. You can equip it with a small tray. System nuts insert in the box the shaft of the rotation matrix. Secure the matrix to the shaft so that its surface coincides with the level of the upper face of the box. Secure the box to the frame using bolts and nuts. Reinforce the frame of the electric motor. Connect a belt drive shaft of the matrix and the motor shaft. Make a tin trumpet for sleep the original product (it may be an ordinary tin bucket with the bottom cut off). Install the socket on the upper input hole of the box. Install the sensor roller with worm gears. The granulator is ready. 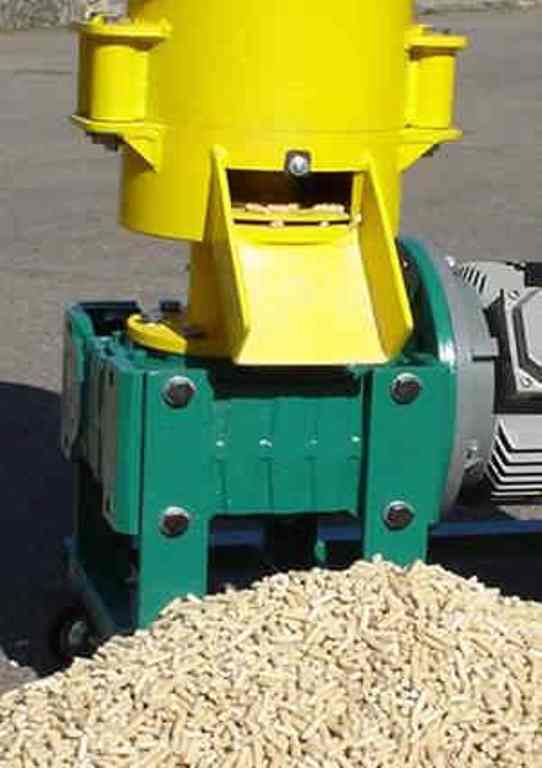 Pellet mill - mechanism that is designed to overwork waste agricultural and forestry industry and obtain a granular granulated feed or fuel pellets, pellets. Granulators vary in principle. They are drum, disc, belt, vibration and etc. Typically, the matrix for homemade pellet mill is purchased already prepared, for example, from the pellet mill the GM is 0.5. And the matrix, and the rink should be made of hard metal, as are the movable mechanism of the pellet machine details, and hence the most wear. Debug granulator consists in the accurate selection of diameter dies and Rev the motor.